(You may notice some changes to our website throughout the next couple of weeks. We’re in the process of updating our website to bring you new and exciting photos and information about our Club! 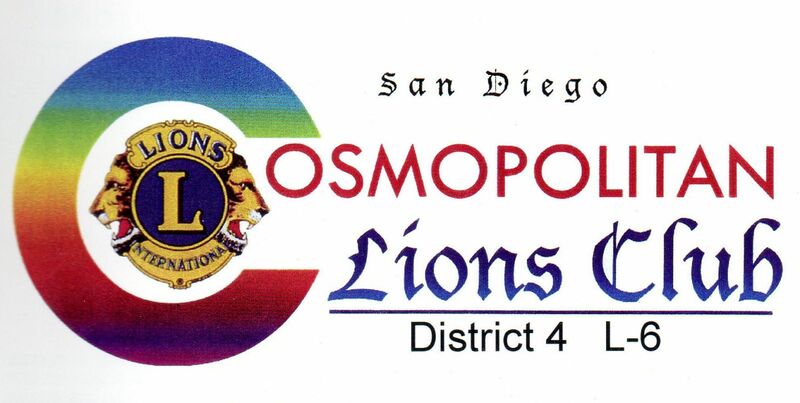 San Diego Cosmopolitan Lions Club was chartered on July 4, 2004. We hold the record as the first club to be chartered in LY 2004-05 worldwide. We belong to Multiple District 4 (California) and Sub-District L-6 (San Diego & Imperial Counties). Our current President is Armando "Manding" Abayon. 2004 – 2005 Priscila Pizarro, M.D. The Melvin Jones Fellowship Program is a generous way to show commitment to the humanitarian work of LCIF. The MJF Program was established in 1973 in honor of Melvin Jones, the founder of Lions Clubs International. The MJF program recognizes donations of US$1,000 to Lions Clubs International Foundation (LCIF). New MJFs receive a pin, commemorative plaque and a letter from the LCIF Chairperson. If the donor so chooses, he/she may use their donation credit to recognize another individual with a MJF.